Inbox is an automated mechanism that sorts replies by categories. Inbox helps you quickly find contacts who are interested in your offer and reply to them manually. You can reply to their email via the Inbox tab, however, further responses to and from the prospect will not be reflected in the thread. Which means that you cannot fully substitute your original email inbox with the Inbox at Reply. You're also able to add custom categories, but you cannot set up key words for them. Reports tab. You can see percentage from all replies in campaign as Interested. Zapier. You can filter contacts by Interested using the New Email Replied trigger. Integrations. 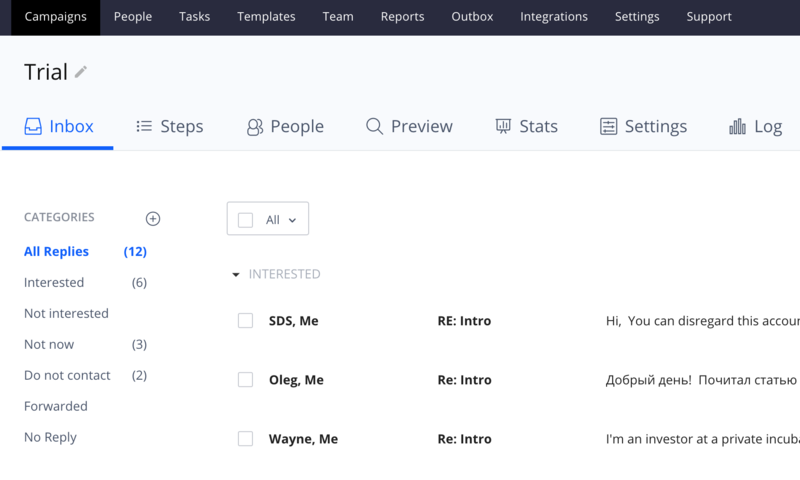 Update contacts in your CRM using native integrations.